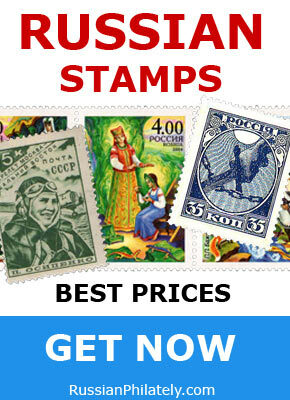 The first postage stamps of Soviet Russia were issued in November 1918, celebrating the first anniversary of the establishment of the Russian Soviet Federated Socialist Republic. The set of two stamps (35 and 70 kopecks) were prepared by Provisional government, but were approved and issued under Russian Soviet Federative Socialist Republic authority. The first definitive series of the RSFSR was issued in 1921. It included five designs of new Soviet symbols such as agricultural labour, industrial labour, science and arts, hammer and sickle, and freed proletarian. Reflecting new political goals, RSFSR postage stamps provided visual messages of the values and major social groups within Soviet society. Portraying the three social groups, the RSFSR’s final definitive issues in 1922 and 1923 depicted the worker, the soldier, and the peasant that constituted the Soviet state. These were stylistic representations in the form of classical busts resembling portraits of monarchs and other heads of state on stamps of other countries. Replacing the portraits of the tsars, depiction of the three social groups was on purpose, because the Soviet government “specifically decided to create images which would symbolise the idea of worker-peasant power.” The sculptor Ivan Shadr was author of these images. Designing the busts, he created the worker first, then the Red Army soldier. These two stamps appeared in December 1922. The stamp showing the bust of the peasant came out five months later, in May 1923. Among the eleven denominations of the fourth definitive issue, the worker appeared on stamps three times, the soldier six times, and the peasant showed up on two stamps.